While working as a ticket taker at the Guggenheim Museum in New York, Mia Wen Hsuan Liu, an art school grad student at the time, was compelled to use tickets as her medium. Tickets (purchased in bulk from the museum), colored masking tape, a motor, and plywood resulted in the creation of an op art-reminiscent series. Consider this photo just a tease... you'll find fascinating images on her Flickr page... really, it's worth the click! 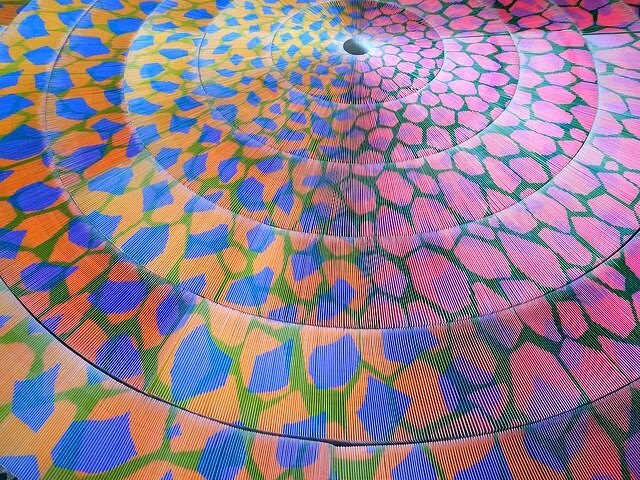 Mia Liu began by drawing geometric designs that she translated into huge, three dimensional wheels of color. Masking tape adhered the two sides of each ticket together; they were then arranged on rotating sheets of plywood. The entire installation, as seen at the IT Park Gallery in Taipei City, Taiwan last fall, took three years to complete. Yes, she had helpers... can you imagine how many hours this took to do?! Find an interesting article about the exhibit here. By the way, thanks to everyone for the nice comments and links to your quilled birds on Wednesday's post - so many wonderful examples! Wishing you a lovely weekend. I have something very fun to show you on Monday; hope to see you then! pretty freaking dazzling. i'm also in love with the calendar upcycled boxes you linked. such a cute recycling idea! i can't wait until monday!! the suspense! Truly worth the click Ann, It has taken three years to make but the result is worth all the work she has done. wow really awesome, talk about patience, love it! !